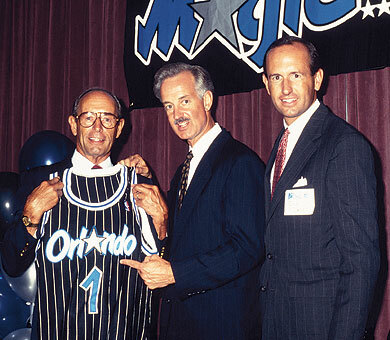 The Magic were one of the four new expansion franchises awarded by the NBA in 1987 along with the Charlotte Hornets, Miami Heat and Minnesota Timberwolves. Initially, the NBA was planning to expand by three teams, with one franchise going to Florida; however, when both Miami, and Orlando ownership groups made successful pitches, the expansion committee decided to expand by four teams, allowing both to have a franchise. The Magic became the first ever major-league professional sports franchise in the Orlando area, following an expansion fee of reportedly $32.5 million. The Magic hired Matt Guokas as the team’s first coach, who helped the Magic select twelve players in the NBA Expansion Draft on June 15, 1989. On June 27, 1989, the Magic chose Nick Anderson with the 11th pick in the first round, who became the first draft pick of the franchise.